Try an Exciting Jeep Tour! Check the BOOK NOW button below for East Zion Jeep Tour details and pricing. Take in the beauty of our unique landscape from the very top. From this incredible vantage point, you will be to enjoy the beauty and grandeur of not only Zion but all of the surrounding national parks and wilderness area. This incredible view will leave you speechless. Snack and water included. Gain elevation rapidly as you ascend switchbacks to scenic viewpoints, all the while learning about the flora and fauna of the area. Pass an old abandoned miners cabin on your jeep tour into our secret Brushy Cove location. Scenic views of Zion National Park and surrounding canyons from the top of the Radio Tower. Snack and water included. Venture to scenic overlooks of the east fork of the Virgin River. Discover the dramatic geology that has been exposed by natural erosion. Learn how the Native Americans, and early settlers, existed in this dramatic terrain. Enjoy views of wildlife and diverse biology as it unfolds before you. Snack and water included. Slot Canyon Exploration - Rappelling / Jeep Tour Explore the back country to the beginning of one of Zion National Parks' major slot canyons, and experience two separate rappels that extend a total of over 120 feet. Come to understand how the forces of nature have created slot canyons. Note: Weight Limit - 250 lbs. Hiking and rappelling involved. Snack and water included. 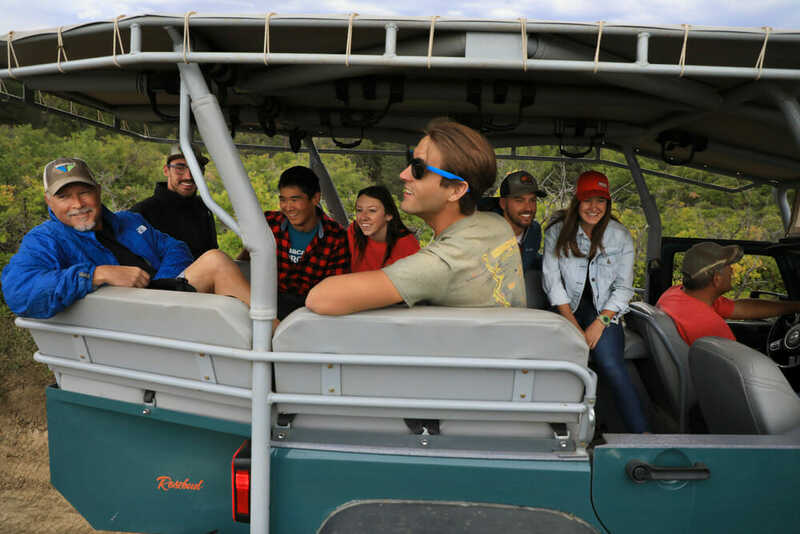 SUNSET JEEP TOURS: One of our popular jeep experiences is our Sunset Jeep Cruise. Departure from the recreation barn is about an hour before Sunset and will follow the North Fork Road and then divert to a road that takes leads to our famous Pine Knoll. You'll enjoy 360 views watch the sun set on the western horizon and enjoy water and snacks. It's breathtaking! East Zion Jeep Tours are enjoyable experiences in our specialized off-road cruiser and enjoy touring the scenic overlooks and canyons of this region. Your driver / guide will take you to some remarkable locations and will provide information on the history and geology of this area, that is part of the geologic region referred to as the Grand Staircase. The effects of erosion are visible at every turn and wildlife will often show themselves as you pass along. It is not uncommon to see deer, wild turkeys, rabbits, and a variety of birds as you venture down into canyons or along scenic corridors. Turkey vultures, hawks and the occasional eagle are often visible overhead. The large California Condor with a wing-span of up to nine feet is known to venture into this region from time to time. Forests of pine and juniper with their diverse vegetation will bring sweet aromas to you as pass in and out of different vegetation zones. The views and vistas you will see will take your breath away.